I was delighted with Shantewe who bolted up on her racecourse debut at Wetherby last week, in turn beating a 16 runner field. It was a pretty taking debut and we’ll step her up to Listed class at Market Rasen in mid January. We have run 8 horses in bumpers this season and all have been placed, with a couple of winners and 4 finishing runner up, so the future looks very bright. Shantewe bolts up on her racecourse debut. One youngster who I have always liked was Midnight Chill, but it had never quite fallen for him. However, after a summer wind operation and a confidence boosting win in a Charity race, he lost his maiden tag on his chasing debut in the feature Class 3 novice handicap chase at Sedgefield last week. Now that he knows he can breathe I’d like to think he can keep progressing throughout the season. Midnight Chill wins on chase debut. 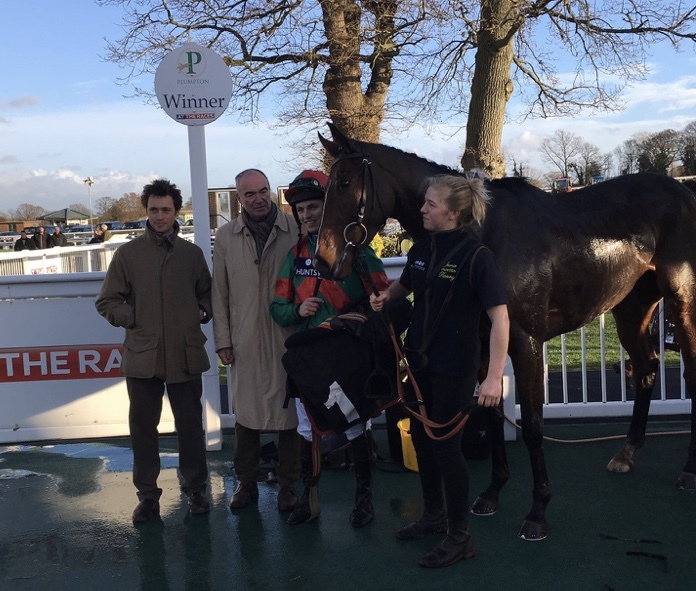 It was a great thrill to see Max Kendrick ride a lovely winner on Coole Well on Monday at Plumpton for Carolyn Kendrick. He showed some useful bumper form last season, and is a decent recruit to the yard this season to go novice hurdling with. The front pair pulled a long way clear here, and I think he could be one to follow this season. He hasn’t been the easiest to train, and Lucy rides him each day so deserves a lot of credit. 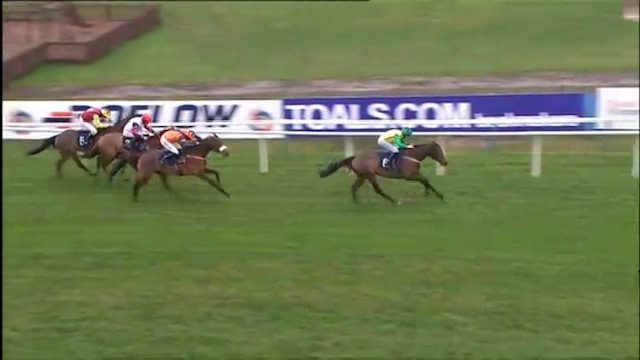 Coole Well wins his novice hurdle well. Having been 3rd in the Grade 2 West Yorkshire Hurdle earlier this month, Monbeg Theatre was 4th in the Grade 2 Long Distance Hurdle at Newbury last Friday. I’m not sure he truly saw the 3m1 trip out, and we might well drop him back to 2m5, and there could be scope off his handicap mark now. He could be one for the Coral Cup at the Festival…..
Another older horse to be flying the flag for us is Fact of the Matter who ran so well in the Glenfarclas Cross Country race at Cheltenham at the BetVictor meeting. He was just touched off to finish a fine 2nd beaten less than a length, with the Grand National winner (Tiger Roll) back in 4th. He’ll head back for the Cross Country race at the December meeting now. Fact of the Matter is narrowly denied another win at Cheltenham in the Cross-Country race. We set off on a road trip up North, with Filemon and Our Reward last week. Page Fuller had her come back ride on Filemon who was 3rd (beaten less than 2 lengths) at Market Rasen, and Our Reward filled the runner up spot again at Catterick. He seems to enjoy running at idiosyncratic tracks, so we’ll be looking for another race at Fakenham or Sedgefield for him in the coming months. Whilst we took Kalahari Queen up to Ayr in the search of some soft ground. She finished 3rd but didn’t jump very well, so will need some remedial work before we see her out again just before Christmas. Two horses who will be heading away for a short winter holiday are recent winner Between the Waters, and the ultra-consistent Some Day Soon. He’s run five times for us now and been 2nd on four occasions. I thought I’d found the perfect opening for him on Thursday last week at Taunton, only to bump into the hottest of the two divisions of the novice hurdle and finish 2nd again pulling 17 lengths clear of the 3rd horse! I am quite sure if we look after him through the winter we can go ‘pot hunting’ with him through the spring. I have recently acquired a cracking bumper horse from Ireland. Chapmanshype is a 4-year-old gelding who won a Punchestown bumper on debut in October. He is by a first season sire, Aizavoski (who is by the champion, Monsun) and he is from the family of The Last Samuri (2nd in the Grand National) and the Graded winner, Soxophone. Interestingly enough, I bought Thistle Do Nicely at this sale last year, and he had a similar profile to Chapmanshype. I think he’ll head to the Listed Bumper at Ascot just before Christmas.